Bayern were issued their first loss of the season to an impressive Arsenal defence. Guardiola’s team were the cause of the majority of their issues with a possession game which lacked intensity and failed to have a good enough level of penetration as they dominated the passing stats but failed to convert them into chances. The starting formations of the two teams. With what is becoming a common shape, Arsenal maintained their asymmetrical 4-2-3-1 shape with Ramsey as a deeper RM as opposed to a more advanced Alexis on the opposite left. A double 6 of Coquelin and Cazorla was also on show whilst Theo Walcott was a lone striker ahead of Mesut Ozil. Guardiola’s side were in somewhat of an orthodox 4-3-3. David Alaba was the left centre-back which meant Bernat started on the left of defence with Lahm on the opposite. Alonso acted as the deepest midfielder behind a pairing of Thiago and Arturo Vidal. In attack was a trio of Douglas Costa, Lewandowski and Muller from left to right. Some asymmetry came to this attack at times too, with Costa staying closer to the touchline whilst Muller moved into space from the right. As I said in the opening paragraph, many of the issues which Pep encountered throughout the 90 minutes were caused by Bayern themselves. Perhaps most encompassing was a very slow ball circulation. All throughout the possession game, Bayern moved the ball far too slowly with a lack of intensity in each pass. Without moving the ball at pace, they struggled to use it to disorganise a passive Arsenal and thus weren’t able to consistently break into dangerous areas. A contributing factor in this was their positional structure in Arsenal’s half, which was too focused on stability over penetration. When maintaining possession ahead of Arsenal’s block, it was quite common to see only Lewandowski within the block as Thiago, Alonso and Vidal would stay behind for the circulation. Combine this with the half-space orientation of both Bernat and Lahm and you have 5 players on the outside of the Arsenal block leaving little means of actually getting into it. 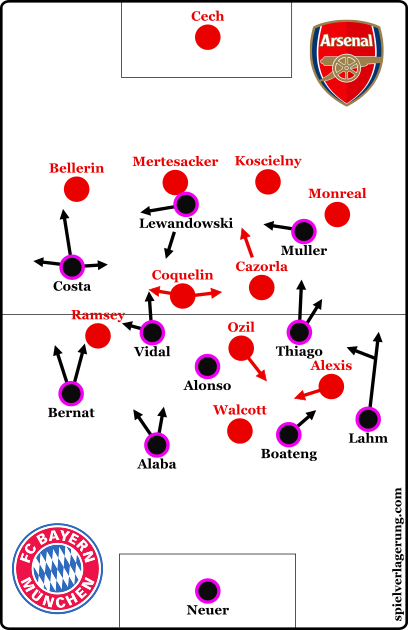 Bayern’s passive positional structure within Arsenal’s half. Because of this, Arsenal’s task was made much easier as they often had to simply sit back and allow Bayern to have this deep and non-threatening possession. With only Lewandowski (and usually 1 more midfielder) within the defensive shape, it was quite easy to control the relative passing lanes and wait for their chance to break in transition. Their attacking strategies were generally standard for this season, with them seeking to integrate Douglas Costa in a 1v1 on a frequent basis against Hector Bellerin. The product of this was lacking however as Douglas Costa didn’t make the most of the moments where he beat his Spanish opposition with poor crossing/type selection. His service was also lacking somewhat as Boateng failed to make as many successful switching passes to him when moving up from the defensive line. To get consistently accurate balls into the winger would have been a key considering Arsenal’s lack of ball-orientation but despite their passivity and lack of access, the passing was sub-par for the likes of Boateng and Alaba. Yes, this was *actually* Arsenal’s defensive shape. Aside from this, the usual central breakthroughs were made difficult with a deeply-set midfield. One of Bayern’s best chances of the first half occured when Thiago received a pass within the block and combined with Muller to take a free shot from the penalty spot. However aside from these quite rare moments, Bayern’s lack of occupation in the spaces between the midfield and defence made for a lack of access through the centre. With his side struggling to create in the final third, Guardiola applied some small changes to his system. He swapped the positions of Vidal and Thiago so that the Spaniard now was oriented to the left and vice versa whilst Vidal became more aggressive in his positioning. Situationally he would become near the same height as Lewandowski and in doing so, became another number within the defensive block to aid penetration. With Vidal higher, he would also help incorporate Thomas Muller through situational rotations which would bring the German into more threatening areas. As the game developed, Lahm would also begin to make more movements into the right half-space from his full-back position. This was likely in an attempt to aid the central possession game by creating potential for greater combinations and overloads whilst allowing an existing CM to move higher into the Arsenal block. Considering the lack of presence within Arsenal’s 4-4 block, it was interesting to see the development of Lewandowski’s orientation. The pole began to make more frequent dropping movements towards the left half-space where he would offer for passes and connections. At times this worsened their situation as the only balancing movement would come from Muller, and even then it wasn’t a certainty that Lewandowski’s space would be filled. During Bayern’s initial phase of possession, it was interesting to see Arsenal take an aggressive approach with a high press featuring some man-orientations. Walcott paid a particular attention to Boateng with the support of Ozil behind him (who himself was more oriented towards Alaba at LCB) as they looked to stop any short build-up from Guardiola’s side. In doing so they looked to create moments to win the ball in a high position, which is exactly what happened for Ozil’s goal in the 94th minute. Immediately following this press however, the London side would fall back into a mid-low block which represented more of a 4-4-1-1 shape. Ozil dropped to be more in-line with the double 6 pairing whilst Ramsey and Sanchez also took deeper positions, the latter being a source of transitions alongside Walcott. The main feature of this system was the clear passivity against the ball with a lack of pressure, particularly in the 6 space with Alonso being given a considerable amount of time on the ball. With a lack of ball-orientation, Wenger’s side shifted from side-to-side very slowly to match the movement of the ball by Bayern. Had the visitors been faster in their passing then this passivity could’ve been a significant problem for Arsenal yet the short half-space to half-space switches were far too slow to expose the equally-slow movement of Arsenal’s defensive block. Not for the first time this season, Bayern’s own possession game let them down with a lack of intensity on the ball. Credit must be given to Arsenal who defended with competence through their mixture of a high and a low press. Although it is all hypothetical, I can’t imagine a similar scoreline had Bayern’s possession game not been so slugglish.